Synthetic peptide within Human PTPN20 aa 185-215 (internal sequence) conjugated to Keyhole Limpet Haemocyanin (KLH). The exact sequence is proprietary. K562 cell line lysate; Human stomach tissue; K562 cells. ab170454 is purified through a Protein A column, followed by peptide affinity purification. Our Abpromise guarantee covers the use of ab170454 in the following tested applications. WB 1/100 - 1/500. Predicted molecular weight: 48 kDa. Tyrosine-protein phosphatase targeted to sites of actin polymerization in response of varied extracellular stimuli. Has tyrosine phosphatase activity towards various tyrosyl phosphorylated substrates. Present in many cell lines (at protein level). Widely expressed. Nucleus. Cytoplasm. Cytoplasm > cytoskeleton > centrosome. Colocalizes with the microtubule-organizing center and intracellular membrane compartments. 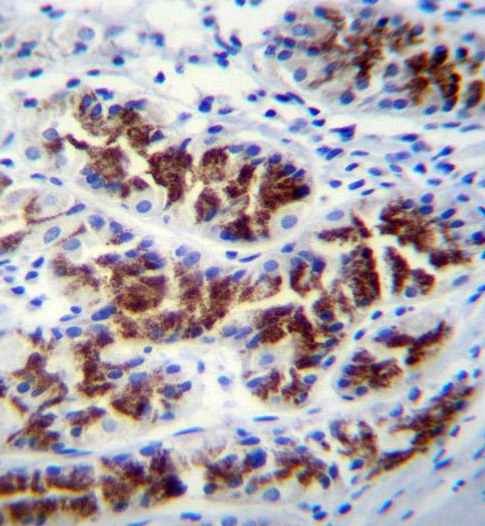 Immunohistochemical analysis of formalin-fixed, paraffin-embedded Human stomach tissue labeling PTPN20 with ab170454 at 1/10 dilution followed by peroxidase conjugation of the secondary antibody and DAB staining. 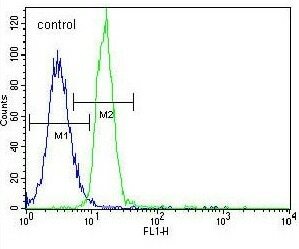 Flow Cytometric analysis of K562 cells labeling PTPN20 with ab170454 at 1/10 dilution (right histogram) compared to a negative control cell (left histogram). FITC-conjugated goat-anti-rabbit secondary antibodies were used for the analysis. ab170454 has not yet been referenced specifically in any publications. Publishing research using ab170454? Please let us know so that we can cite the reference in this datasheet. There are currently no Customer reviews or Questions for ab170454.